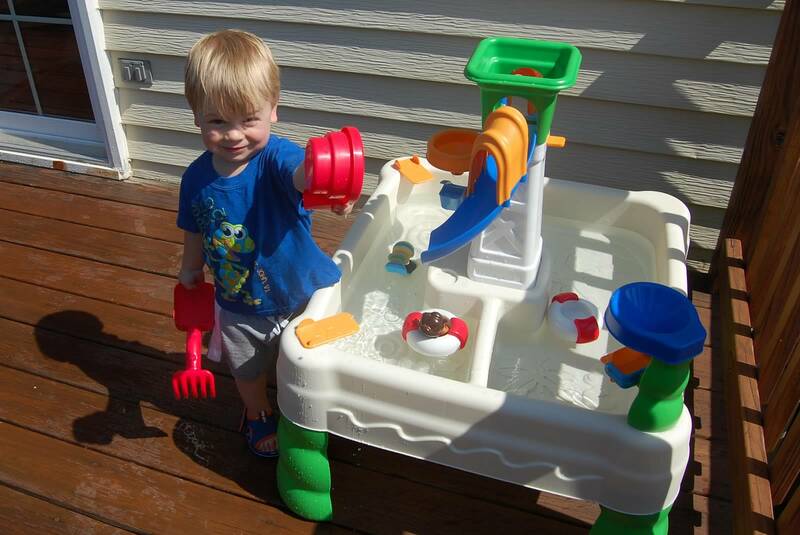 In the morning, before the party, Caelan had a great time playing with his new water table on the deck – a birthday gift from Mommy and Daddy. Then he went down for a nap leaving the 2 1/2 hours before the party kid-free so we could get everything set up and ready. I was kind of amazed at how well the timing worked out! 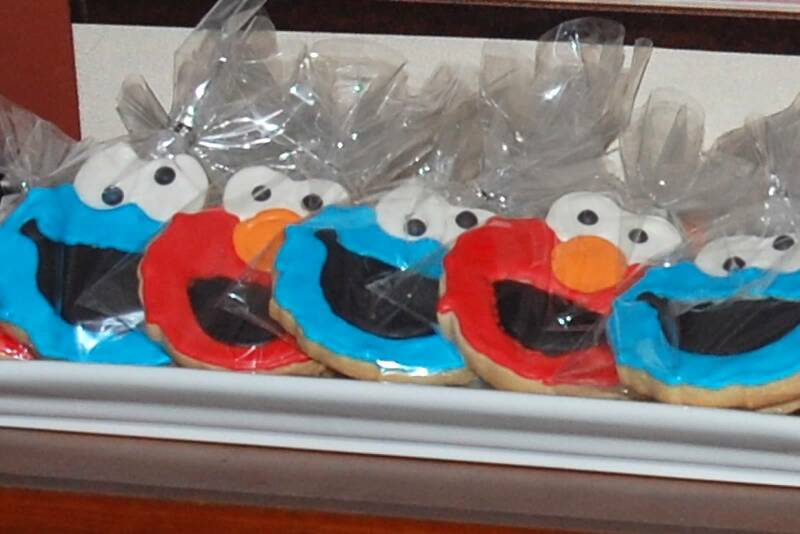 This year we did a Sesame Street theme for Caelan’s party. 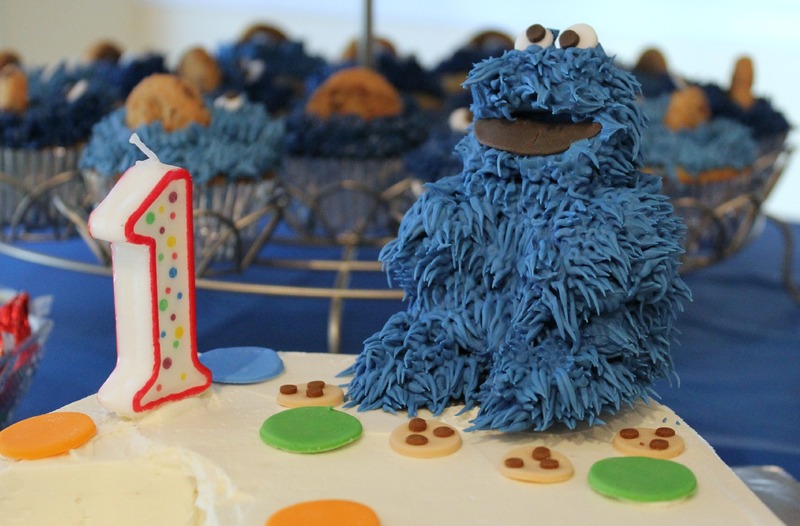 Sesame Street was my original idea for his 1st birthday but I decided to save it until he was older and would enjoy it more and I’m glad I did! I got all the paper products from Party City and months ago, I found these Sesame Street characters (in the freezer section of our grocery store of all places) to decorate with. While Caelan was napping, I also raided his toy box for his plush Sesame Street dolls and used those for decoration too. For the menu, we did “toddler foods” which, conveniently, are big hits with adults as well. We had meatballs in the crockpot, Chik Fil A nuggets, pigs in blankets, mac and cheese, fruit, veggies, and cheese cubes. I’d never actually made pigs in blankets before, but now I’m trying to think of an excuse to make them again – so yummy!! But all of the food was either purchased, made by someone else, or required little to no prep so it was easy! I did make the cupcakes, but those were easy too. I used a box mix for Funfetti and made 3 dozen cupcakes. I used my go-to vanilla buttercream icing and colored it red, blue, green, and yellow to match the cupcake liners and picks that came with the set pictured below. Bill gave me these for Christmas this past year and though Williams Sonoma has since stopped selling them, I was able to get another box on eBay so I had enough for all the cupcakes! Caelan did MUCH better with the cake this year than last year when he kind of just stared at us all like we were crazy. 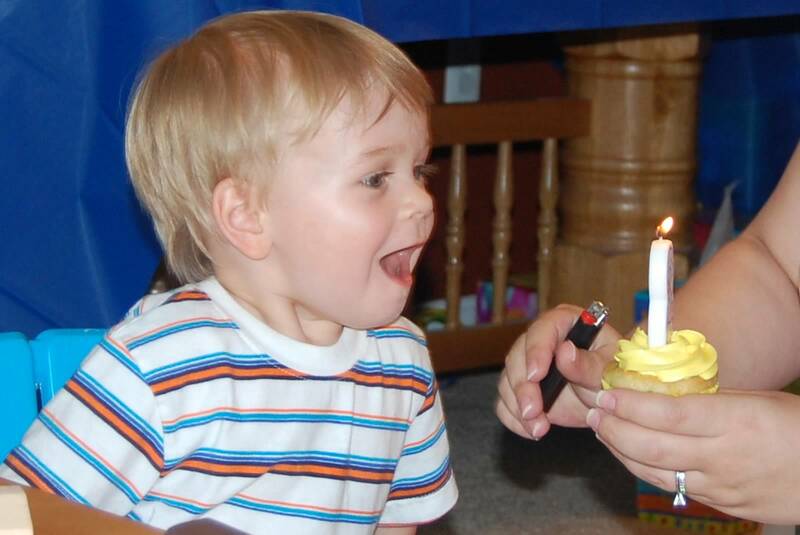 He was excited to blow out the candle on his cupcake and had been practicing. Caelan isn’t much of a fan of cake actually! He did eat some, but after only a few bites, he abandoned it and ran back to the fruit tray for his 800th grape. This kid was loving grapes that day! For the decorations, I got a bunch of balloons for the tables and for out on the deck. Luckily I was able to get these from our grocery store because we don’t have a party store near by. Other than that, I made up a few signs to direct guests to food, drinks, etc. 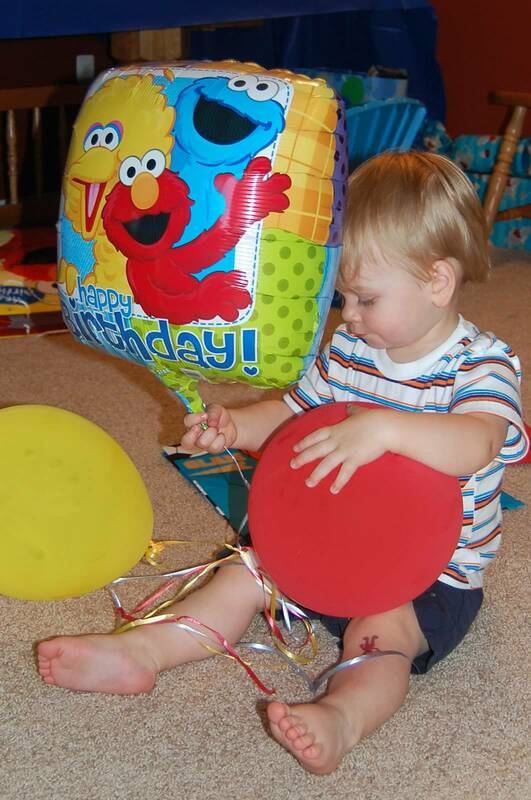 I also put up some pictures from Caelan’s 2nd year. I didn’t take “official” month pictures this year but just chose a favorite picture from each month to display. For favors, I made decorated sugar cookies. 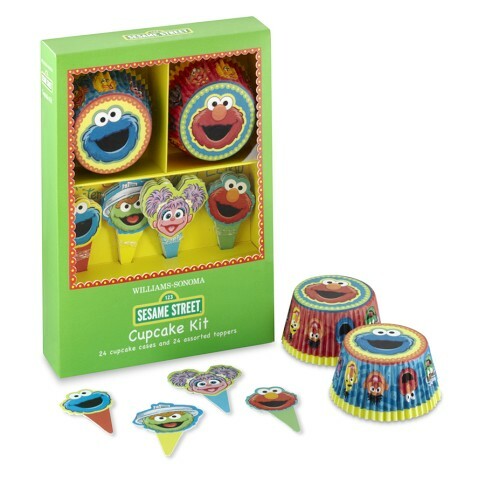 My mom had given me a set of Sesame Street cookie cutters for Christmas (also from Williams Sonoma and also no longer sold) so I thought these would be perfect. I’m going to do a separate post on those since they were such a big project! The party was a lot of fun and I was happy to be able to have it at our house this year! I wish the weather had been just a tiny bit cooler so that people could have spread out on the deck, but at least the kids had fun out there! And the birthday boy seemed to have a great time all day, so that’s the really important part! That’s what these cupcakes have going for them – they’re very pretty on the inside – and actually, they taste very good. But on the outside, they’re pretty ugly. They were supposed to be St. Patrick’s Day cupcakes, and I don’t think that’s clear at all by looking at them, so I’d say they missed the mark there too. Since St. Patrick’s Day was coming up I figured I could make some St. Patrick’s Day themed cupcakes and bring them in to work to share with my co-workers. 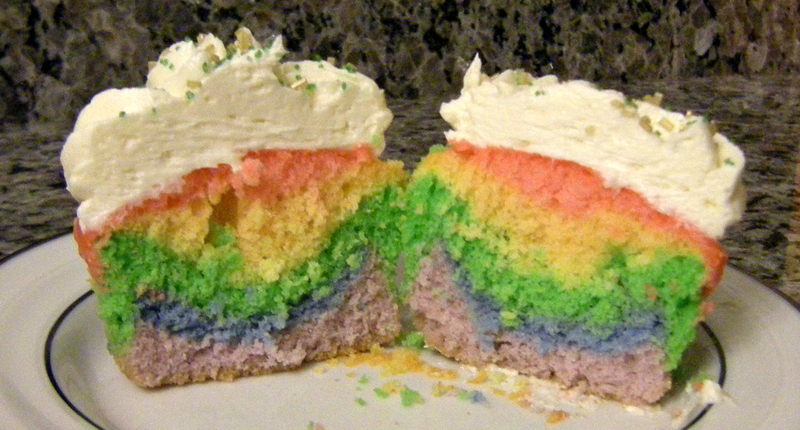 Then I saw a picture of some rainbow cupcakes and I thought rainbow, pot of gold, etc – that sounds St. Patrick’s Day-ish! I used a box of white cake mix for this, and let me tell you, the cake was delicious. I know, box mix = cheating, but they were good so I’m not sorry I took a short cut! I just divided the batter into 6 small bowls and colored each one using gel colors. Then I spooned one spoonful of each color batter into each of 22 cupcake liners. This took approximately forever. 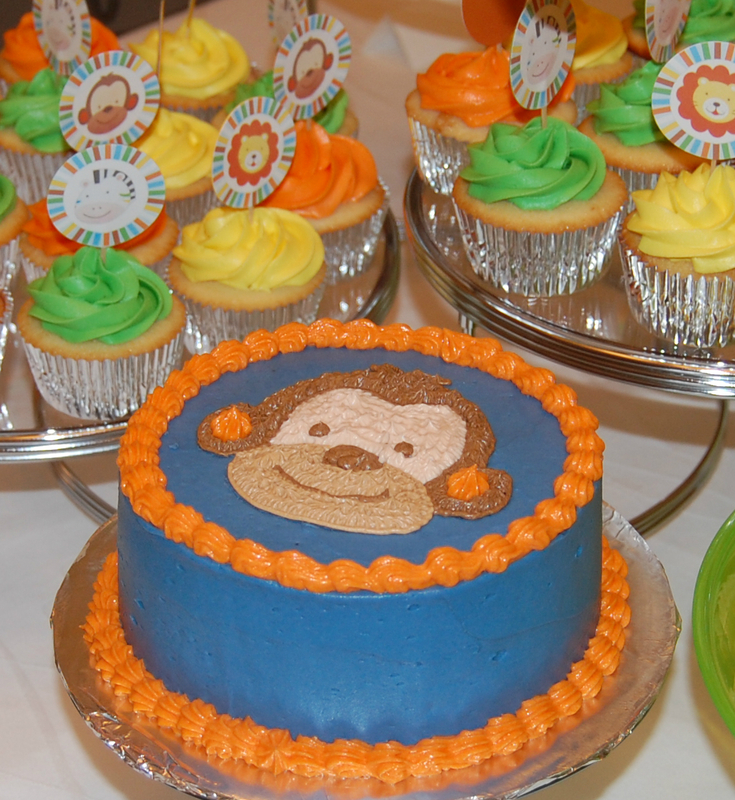 I used plain white frosting (my go-to vanilla buttercream that never fails!!) and piped a swirl using my new super jumbo star tip (Ateco size 9). Seriously, the thing is huge. Then I decorated the top with gold and green sprinkles. Somehow, even though I have about 2 dozen different kinds of cupcake liners, I did not have any plain green ones, nor did I have any St. Patrick’s Day themed liners. I ended up settling on some leftover gold liners which I thought would work (pot of gold, etc) but not so much. 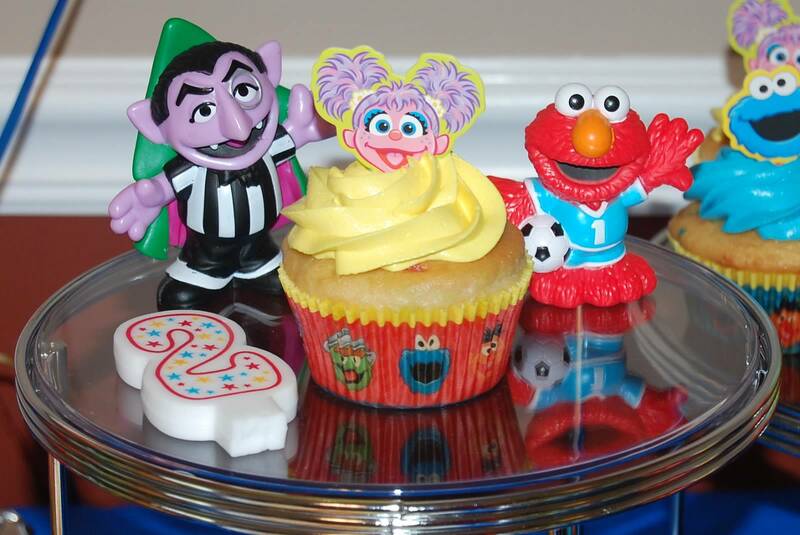 The thing with the rainbow cupcake is that the top of it is red. That really threw me off! And covering the entire surface of the cupcake with frosting is a bit tricky and really takes up a ton of icing. My neighbor sells Arbonne products and she is often hosting parties. She mentioned to me awhile back that she may be wanting cupcakes for an upcoming party and asked about a gluten-free option. 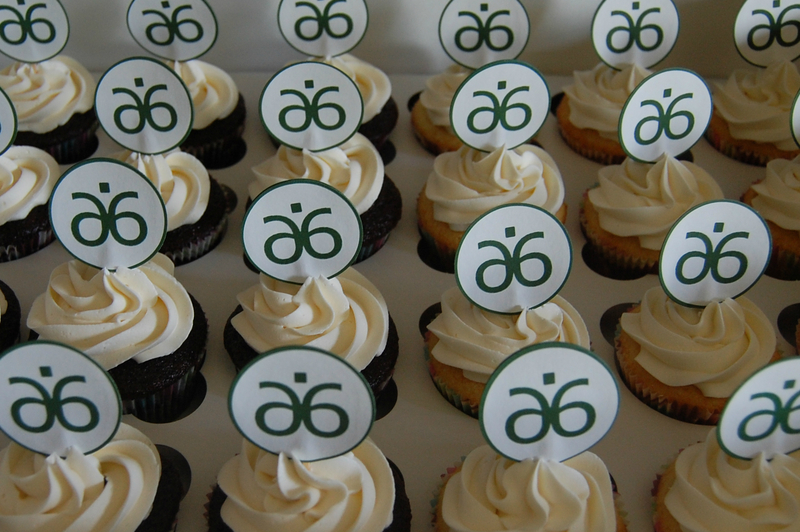 When this party rolled around, she initally asked for about 4 dozen cupcakes – some gluten-free, some gluten-tastic. But when it came down to it, she only needed 2 dozen cupcakes, and none gluten-free. So it ended up being a much more simple order than I expected. I made 1 dozen chocolate cupcakes (1/2 of this recipe) and 1 dozen yellow cupcakes (1/2 of this recipe). I made 1 1/2 batches of vanilla buttercream icing and flavored half of it with almond extract for the yellow cupcakes and left half of it vanilla for the chocolate cupcakes. The little toppers are similar to the ones I made for Caelan’s cupcakes, but with only 2 dozen to make, I got them done in no time! I decided to do a cupcake tower/display for the guests and a smash cake for Caelan. 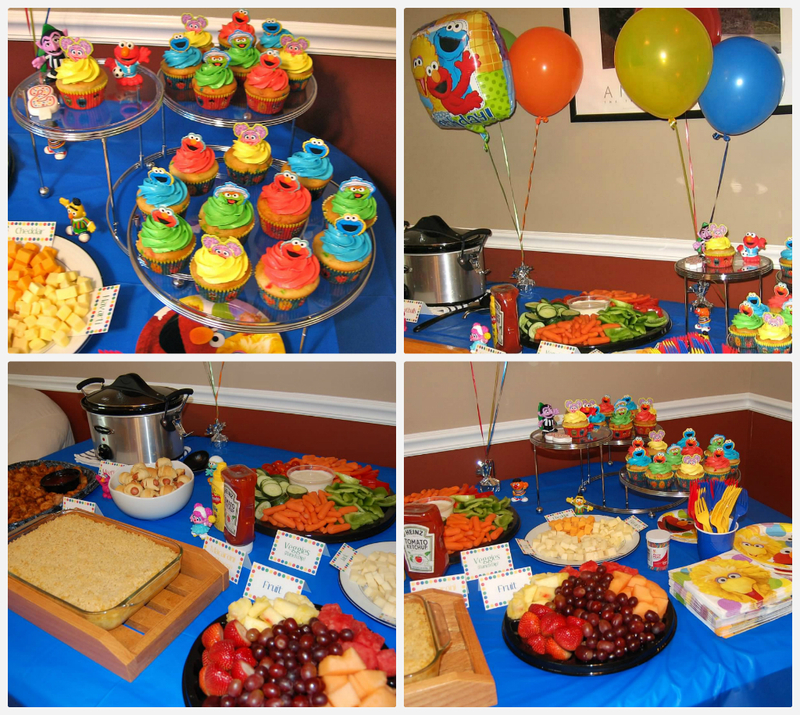 Here are my inspiration pictures – party supplies from the theme I chose. I used this recipe for the cake and cupcakes. The frosting is all from the same recipe, I just switched out some of the vanilla extract for lemon extract or lime juice for the lemon and lime versions. I made and colored all of the frosting the weekend before which was definitely the way to go. Having that all ready to go when I was putting things together at the last minute was awesome. Frosting the 4 dozen cupcakes took all of about 30 minutes. A few weeks in advance, I made the cupcake picks. 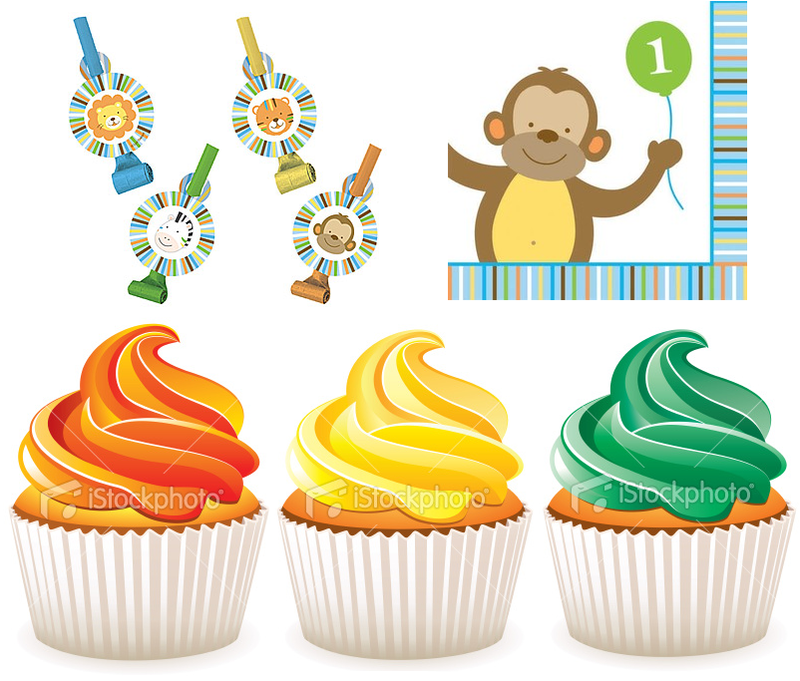 Using the noise makers (pictured above) for inspiration, I designed some cupcake toppers using MS Word. I cut them all out using a giant hole punch and I also cut out cardstock circles in coordinating orange, yellow, and green. A couple evenings of watching TV and gluing paper to toothpicks, and they were ready to go! My neighbor mentioned to me that she would be hosting/attending a few events in the near future and she might want to order some cupcakes. Then she asked if I could make the cupcakes gluten-free (GF). Well…I’m sure I can, but I’ve never done any GF baking before and I honestly don’t know anything about it. So I Googled around looking for recipes and trying to get a handle on the ingredients common in GF baking. Most regular cake recipes have the same basic ingredients: butter, sugar, eggs, flavoring, flour, leavener, salt, liquid (like milk or water). Luckily, all of those ingredients are already GF except for the flour (and some leaveners are not GF, but many are). I found in my search for recipes that many GF recipes replaced the normal white or cake flour with a GF flour mixture plus xanthan gum as a binder. I chose a really simple recipe to experiment with – it simply called for a GF flour instead of a normal flour and did not call for xanthan gum. After a tip from a friend on Facebook, Caelan and I headed to the organic section of our grocery store in search of an all-purpose GF flour. I was utterly overwhelmed when I saw all the options. They had every different kind of flour you could imagine. Or, more accurately, they had every different kind of flour I had never heard of: rice flour, potato flour, tapioca flour, bean flour, quinoa flour, spelt flour, etc. But I didn’t actually see an all-purpose flour (even though such a thing does exist and I’ve now learned that it is usually a mix of some of the aforementioned flours). Not wanting to buy 5 different bags of flour (and I would seriously have no idea which ones to choose anyway), I grabbed a bag of brown rice flour and was on my way. 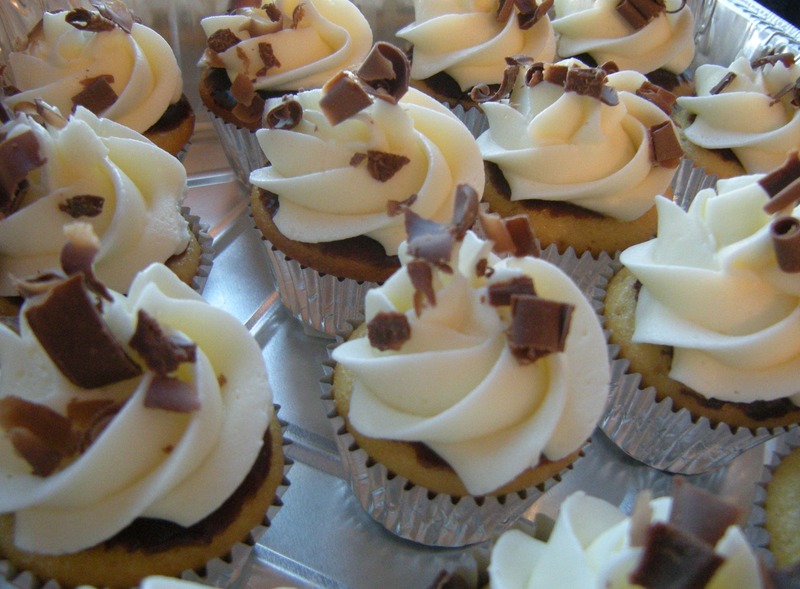 Next time, I am going to experiment with a vanilla cupcake recipe. The ones I found in my Google search pretty much always called for xanthan gum. Though that was available in my grocery store, I really didn’t want to spend $12 on an 8oz bag that would last me 500 years. I think I may try to find a smaller quantity from my BFF (Amazon). I made a baby shower cake last October for Benjamin’s mom, Kristy, when she was pregnant with him. It’s one of my all time favorites! 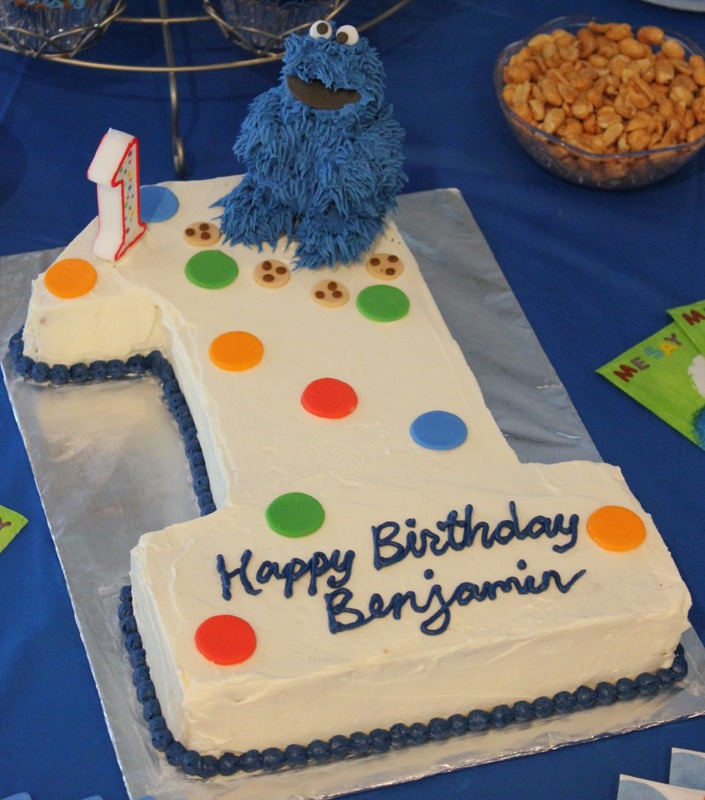 So when Kristy asked if I could make cakes for Benjamin’s first birthday I was happy to do it AND she had a great idea. We used the pictures below (click on them for the sources) to come up with a plan for a 1/4 sheet cake and 2 dozen cupcakes. I decided to use the yellow cake recipe I found over at Smitten Kitchen. I’ve used this recipe once before and I know it makes a nice dense cake which would be great for carving since the plan here was to carve the sheet cake into a #1. I added chocolate chips into the mix since Kristy wanted a chocolate chip cake. I made up 1 batch of chocolate buttercream icing to fill the sheet cake and I made up 2.5 batches of vanilla buttercream for the top of the cake and the cupcakes. For the fondant decorations, I used white and black fondant to make 25 sets of googly eye balls. I also cut out some large dots in red, orange, green, and blue for the cake. 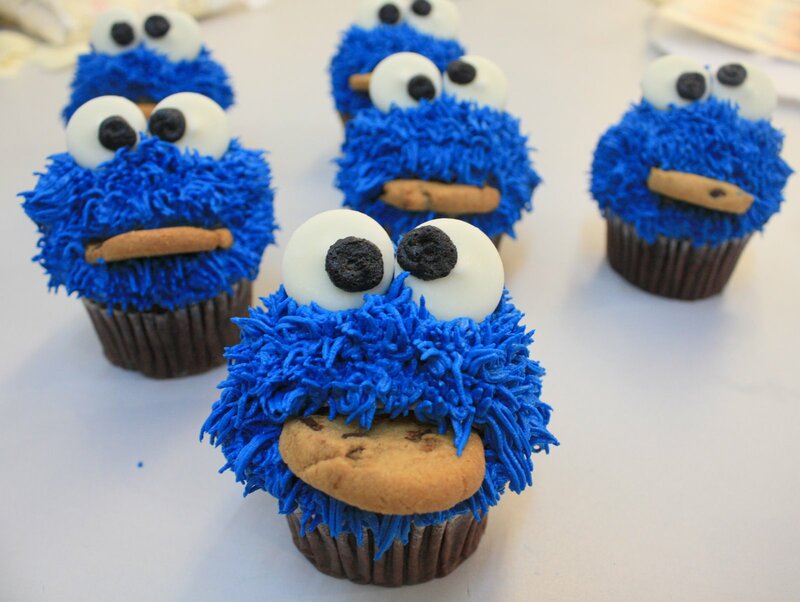 I used mini Chips Ahoy cookies for the cupcakes. 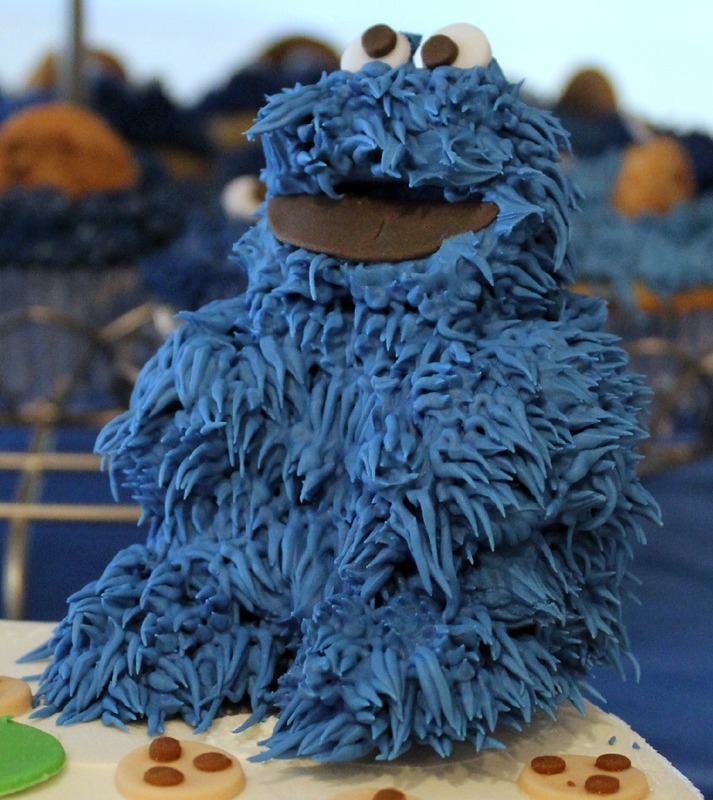 For the Cookie Monster topper, I decided to make it out of blue fondant and then use royal icing for the fur. I was sort of winging it here because I wasn’t sure if the royal icing would stick to the fondant, but it did. 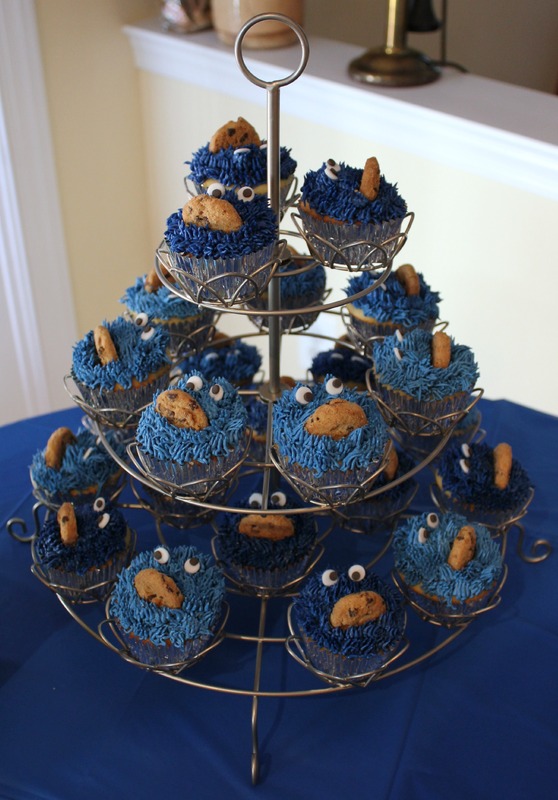 I used a grass tip (Wilton’s #233) for the fur for both the Cookie Monster topper and the cupcakes and it worked perfectly. I made these cakes and their decorations over the course of 4 days. I meant to count how many hours I spent on it, but it was hard to tell. I took lots of breaks to take care of my son so that made counting hours tricky. I think it was about 8-10 hours total though. As much as I am happy I took on this project and as proud I am of how it turned out, it reminded me that I do not have the luxury of 8-10 extra hours in a week for cake baking. It’s really hard to make it work these days. I am in awe of those moms out there who work full time, take care of munchkins, and still have time for a time-consuming hobby like this….’cause I really don’t. I had 2 events for which I wanted to provide baked goods and they were within a week of each other. One was a party given by Caelan’s daycare provider for all of the parents and one was my office holiday party. So I decided to take a shortcut and use a boxed cake mix to make mini cupcakes. A batch of cake batter will make a zillion mini cupcakes (I got 5 dozen out of it before I ran out of liners, but there was a little bit of batter left). I used a French Vanilla mix (because I had it on hand) and I added some almond extract. 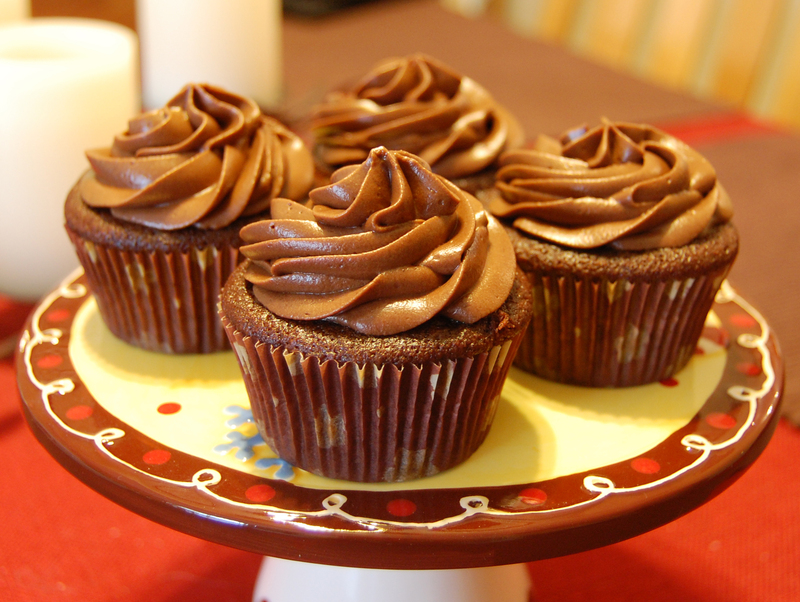 I decided I would dip the cupcakes in chocolate ganache before frosting them with almond buttercream. I used the ganache recipe found in this post from Annie’s Eats. I had some leftover almond buttercream from the anniversary cupcakes I had made the week before so I just used that. I think the almond flavor was a lot stronger after having been in the fridge for a few days (and that wasn’t necessarily a good thing). I garnished the mini cupcakes with some shaved milk chocolate. I brought a dozen and a half or so of these to the daycare party and put the rest in the fridge (unfrosted, un-ganached). I never did get around to finishing the ones for my office party. Sorry coworkers. But I was kind of “meh” on how these turned out anyway. I don’t know what it was, but the flavor was kind of off. So since I had several dozen of these leftover, I wrapped them up and put them in the freezer. I’ve never frozen cupcakes before, so it’s kind of an experiment. We’ll see if they’re any good if I ever defrost them.